A striped blue gemstone, a form of crocidolite turned to Quartz over time. 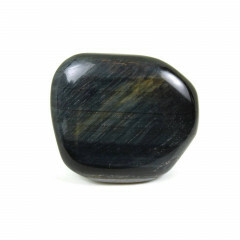 This is a chatoyant gemstone – a type of metamorphic rock characterised by a striped dark blue colour – although Tigers Eye also occurs in a red/brown colour, and a common golden brown colour. The ripping, contrasting bands of colour and silky lustre make a beautiful and comforting pattern reminiscent of deep forests or lagoons. 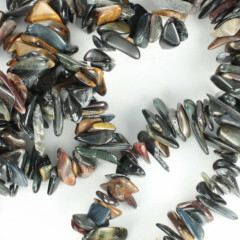 It is mainly used for jewellery making and ornamentation, usually cut into cabochons or pendants. The stone is also sometimes referred to as ‘Hawks Eye’. 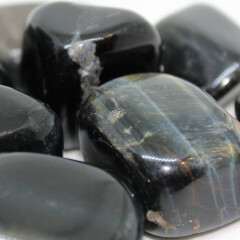 Blue Tigers Eye is actually formed from a mineral called Crocidolite, which pseudomorphs into Quartz over time. As the blue Crocidolite is replaced, traces of Iron remain – the less Iron remains, the bluer the stone. The more iron, the closer to the the common golden colour. Crocidolite is actually a form of Asbestos, but don’t worry – Tigers Eye is a pseudomorph and is perfectly safe to handle – the asbestos has been replaced with Quartz. Anyone wishing to work with the stone in a lapidary workshop should obviously take all the proper precautions. It is found in a wide variety of places worldwide, but the main supplies are Thailand and South Africa. Since ancient times the stone was believed to ward off the evil eye. In fact, it was the stone of choice for the Egyptians to decorate the eyes of their deity statues as it was thought to express divine vision and the protection of the sun and earth combined. It is a powerful aid for amplifying the sensory gifts – including clairvoyance, divination and premonitions, especially when placed on the Third Eye.